Puppies feel secure in confined small places. Having his private crate makes the puppy feel secure. 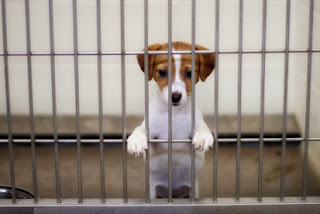 However, some people are of the opinion that crating is like confining a puppy in jail. Therefore, you should never use the crate in order to give punishments to your pet. You must get a crate keeping in mine the size on your dog. It is advisable to get a larger crate and use a partition board to keep it small until the puppy grows. The crate should be large enough to allow the puppy to get enough space to lie down, turn easily and stand up comfortably. You must first introduce your puppy to the crate and let him examine it. He may go in at once or even sniff around. He will eventually become use to the construction. You must start by placing the puppy in the crate for just 20 minutes. Incase he begins to whine, learn to ignore it. Placing a cover over the cage makes the crate seem more confined. In order to keep your puppy occupied you can give him a toy or blanket inside the crate. After a period of twenty minutes, take your puppy out of the crate and directly to the potty outside. Applaud him if he does. After that take him inside and play for about thirty minutes, after which you must place him back in the crate. If he refuses to go in, then bribe him to go by throwing a treat inside. When he enters the crate, be sure to praise him and then close the door. Try to keep him in for a period of twenty minutes once again.Puppies can be kept in the crate for one hour for each month of age plus one additional hour. For example if your puppy is three months of age, then he should be able to stay in for 3+1=4 hours. However, ensure that the puppies are not left in the crate for more than eight hours as they need to be let our regularly for exercise and potty. A new puppy learns better if a schedule is followed. This is because the puppy would know what is expected and will follow commands with minimum fuss.